Ben and I woke up at 7am to meet Miciah and Bryce. Miciah came delivering breakfast! Our first fishing location of the day was a very intimate stream. It was probably my favourite spot on this trip. How could you not like a little free stone stream like this? We did a lot of this for micro species. And micro we did find! There were a lot of Central Stoneroller in the area with some very stunning males. The shallows were carpeted with Orangethroat Darter. The males were either fighting or chasing females and they were a lot of fun to watch. They were very different from the Orangethroat Darter a couple of days before. These fish were very eager to bite. I even had one took my bait while I left the rod with a baited hook in the water while I photograph another catch. 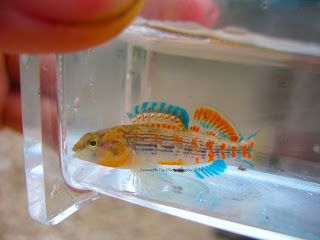 When I went to lift up the rod, there was an Orangethroat Darter attached! How can you not love these beautiful little guys? 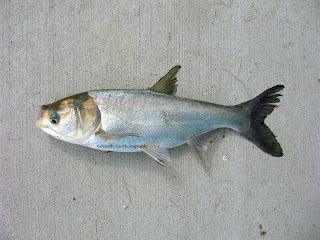 There were about half a dozen Bleeding Shiners in the pool, but the Striped Shiner, Sand Shiner and Bluntnose Minnow were often too quick to the bait. 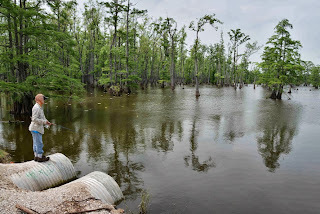 I was targeting Central Stoneroller and the Bleeding Shiner often came in to steal the bait from the Stoneroller...but their quick bite always caught me off guard and I missed the bite every time. Miciah was able to catch one though. They are amazingly beautiful! That one species alone is enough to get me back to the area in the future. Ben then noticed a couple of Logperch and all of a sudden we all saw Logperch. 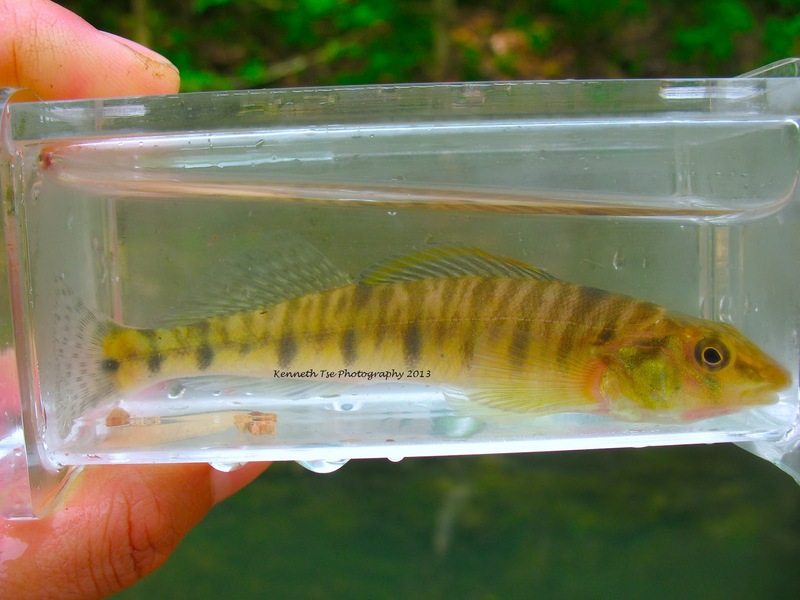 This is a subspecies of Logperch that perhaps one day would be split again into separate species, so I took a picture of it just in case. Ben found some Fantail Darter downstream and all of us went fishing for them. 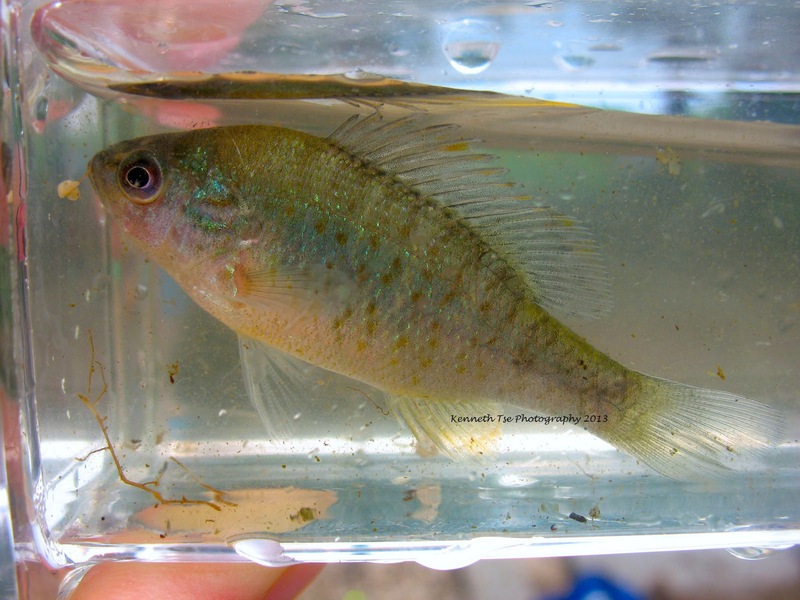 Other species caught were Central Longear Sunfish, Slender Madtom and Blackspotted Topminnow. It was truly a microfishing paradise! After the fun, we decided to move to Horseshoe Lake to give me a shot at Spotted Gar, Orangespotted Sunfish and Western Mosquitofish. We fished a launch area and found two of the targets. We then moved to a cypress swamp area to try for Spotted Gar. Ben saw one, but it was the only one in the area and it quickly disappeared. The area had a lot of snakes...including two Cottonmouths that we saw. One was hiding under a log that we had walked pass a few times...and I was the one who got a bit too close (a few feet away) and the snake luckily escaped into the water instead of striking my leg. It was a scary moment. Ben and Miciah seemed unscathed and fished on the shoreline. I'm "snake bit" so to speak...so I decided to fish from a culvert. I hooked and lost a few Shortnose Gar and had my hands full with a tail snagged Silver Carp. Ben landed a Shortnose Gar and Miciah and Bryce netting a few interesting fish like Pirate Perch, Bluegill and Warmouth. With nothing much going on, we decided to fish a dam area. Due to the high water, one shallow area was flooded and it was LOADED with Shortnose Gar, Spotted Gar and Bowfin. There was also a small school of Smallmouth Buffalo that appeared to be feeding. I tried to entice the Spotted Gar with a spinner. Although I hooked a few, none of them were hooked enough to be landed. After a long try, I finally surrendered and put on a float and single hook. 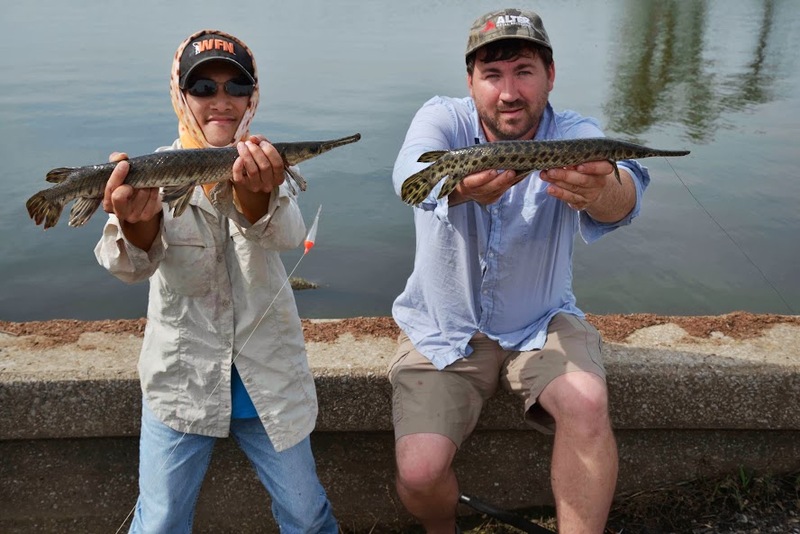 Miciah and Ben caught a few gars, including Spotted Gar, by fishing live Mosquitofish that they netted. So I switched to livebait. 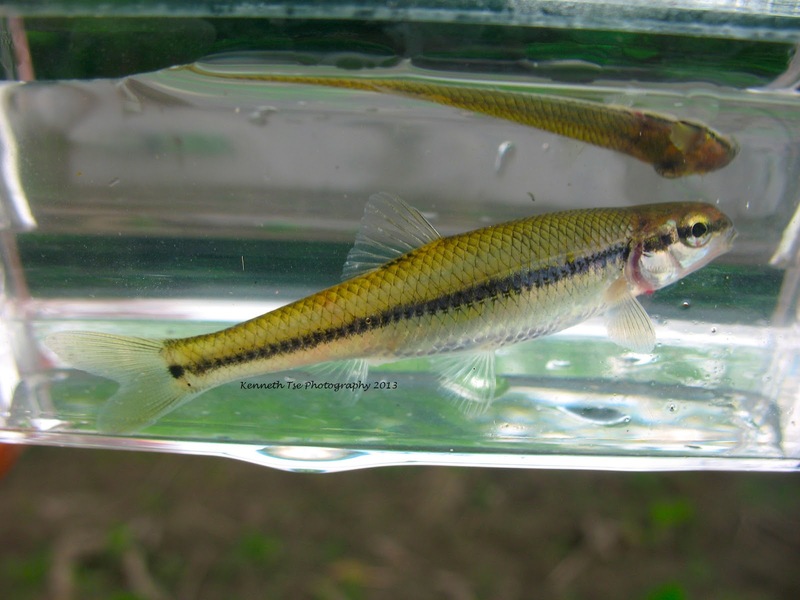 With the first Spotted Gar within casting distance, I tossed the Mosquitofish next to the gar's snout and it was quickly snapped up. 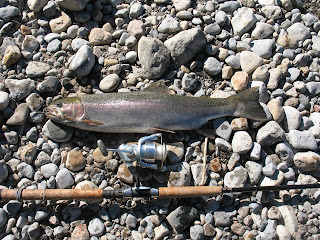 I waited for a long while for the fish to completely swallow the bait until the hookset. Finally, I was able to land my first Spotted Gar. 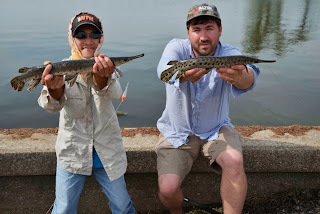 Conveniently, Miciah also caught a Spotted Gar so we had a double! 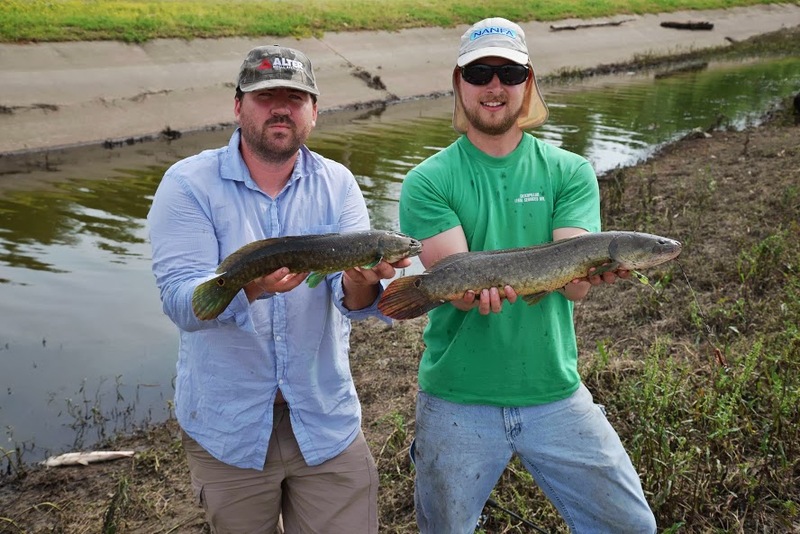 Miciah and Ben were using worms as well and caught some Bowfin. Here was one of their double Bowfin. I was preoccupied and entranced by the gar so I couldn't be bothered with the Bowfin. After catching the Spotted Gar, I decided on trying something difficult. In hindsight, I should have try to entice one of the feeding Smallmouth Buffalo...but the idea of a Silver Carp on the fly was too exciting. 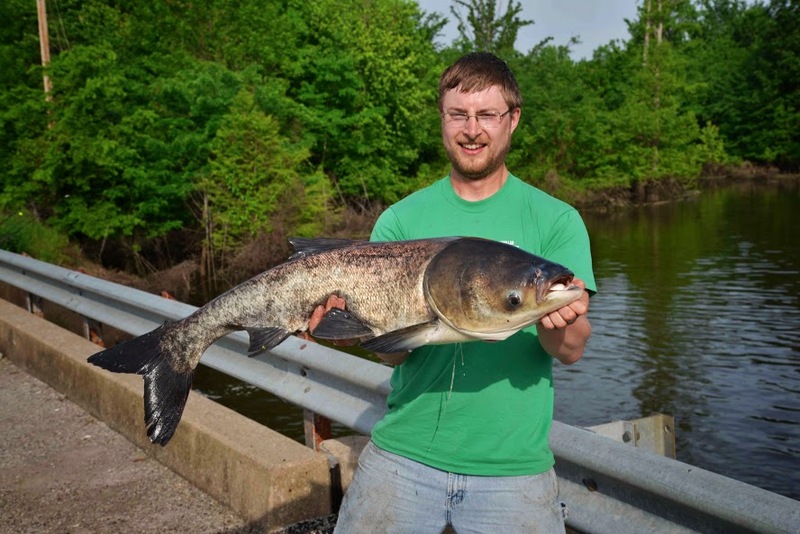 There were Silver Carp jumping non-stop at the dam. I fished an Algae Fly at the dam with the 8-wt and had a hit and long distance release on the first cast. That basically kept me motivated to keep casting. Meanwhile, Ben was fishing on the other side of the bridge and hooked a Bighead Carp with a spinner. There was no doubt the carp took the spinner deep into its mouth. What was this plankton feeding doing with a spinner was a mystery, but a legit catch is a legit catch, and this is a wicked spinner caught Bighead Carp! Congrats Ben! Alas, my Silver Carp on the fly was not to be. 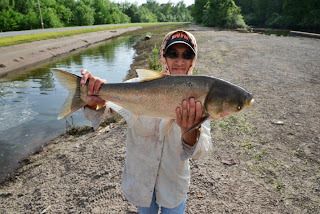 I did snagged a Silver Carp on the side that took about 20 minutes on the fly rod to land. It was a tiring fight that was not helped by the fact that the fish used its broadside in the strong current to fight me. 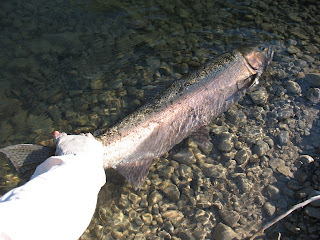 Although there is no honour with a snagged fish, we still took a picture of that big Silver. And I had to order this...Fried buttermilk chicken breast, fried okra, baked sweet potato with a pile of brown sugar on top and cornbread. Miciah and Bryce treated us to dinner again...they simply would not allow us to pay. After dinner, Miciah and Bryce had to be on their way back to Michigan. Ben and I would be headed back toward Champaign. Our next day was mostly a travel day so there is no fishing to report. We did explore a couple of areas but didn't find much interesting. Ben dropped me off at the bus station at 3pm and my 5:30pm bus arrived in Toronto at 6am on Tuesday morning. I was very tired at the end of the trip...but it was a VERY SWEET long weekend trip! I have to thank Ben for hosting me the entire weekend. We covered over 1400km, traveling from Chicago to the southernmost tip of Illinois, and Ben was driving the entire time. He took care of all the camping gear and sleeping arrangement. Ben spent a lot of time planning our fishing itinerary and we were very successful in catching a lot of lifers. Miciah and Bryce treated us every chance they had. Not to mention that they were very knowledgeable about the Midwest fish. Bryce spent a lot of time photographing for us and filming some of the action. He didn't spend much time fishing but you could tell he was interested in every fish caught. I can't wait for the next time fishing with all three of them. I hope it'll come sooner than later! We woke up at 5:30am to be on the road early. Our goal was to reach Carlyle Dam by 8am. We actually didn't reach Carlyle until 8:30am where we found Miciah and Bryce already fishing. After a quick hello and handshake, Miciah hurried us to get fishing. There were much to be caught. Ben and I started fishing at the base of the dam where Silver Carp were jumping in the current. The strong current and the commotion cause the fish to jump. It was amazing watching these fish jump several feet into the air, even though they were only a few pounds in weight. Ben and I started fishing a high/low rig tied with two twisted tails. Ben used a 3oz pyramid sinker to slowly slip the rig back in the current, while I used a 3/4oz bell sinker to bounce more briskly in the current. 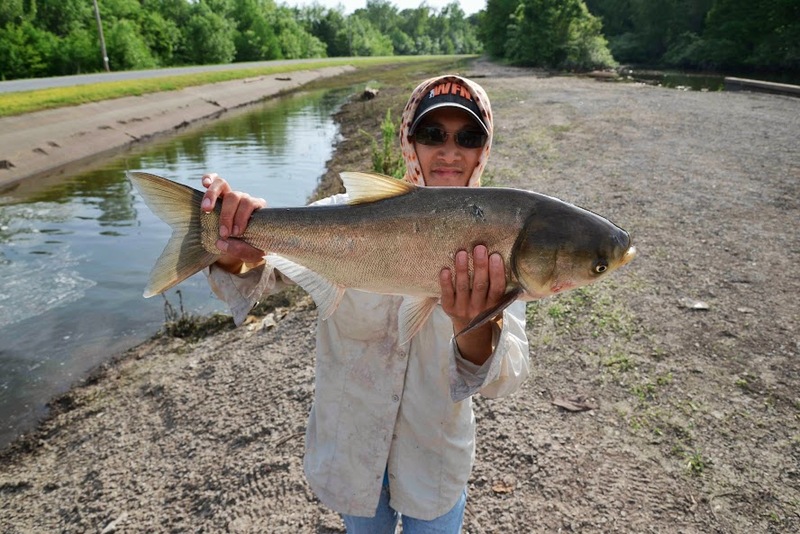 Although there were many Silver Carp in the area, they were not very willing to bite in the heavy and high water. The murkiness may also prevent the carp from seeing our lures. Ben caught a White Bass fairly quickly. 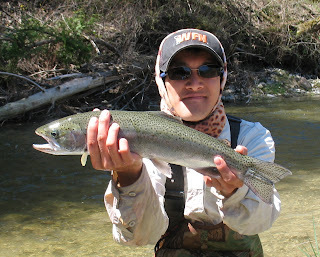 A while later, I hooked onto a strong fish that came unbuttoned when it took me into the main current. However persistence soon paid off when my rig swung across the current. As the rig came into the slower water, I felt a solid "thud" and set the hook. I was immediately into a strong fish that gave two serious run. 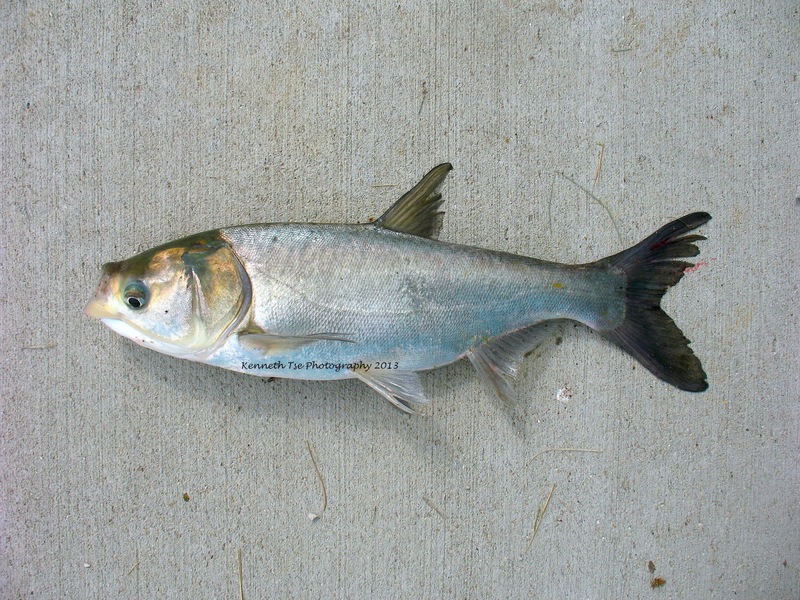 After a few minutes, the fish finally relinquished and I caught my first Silver Carp. 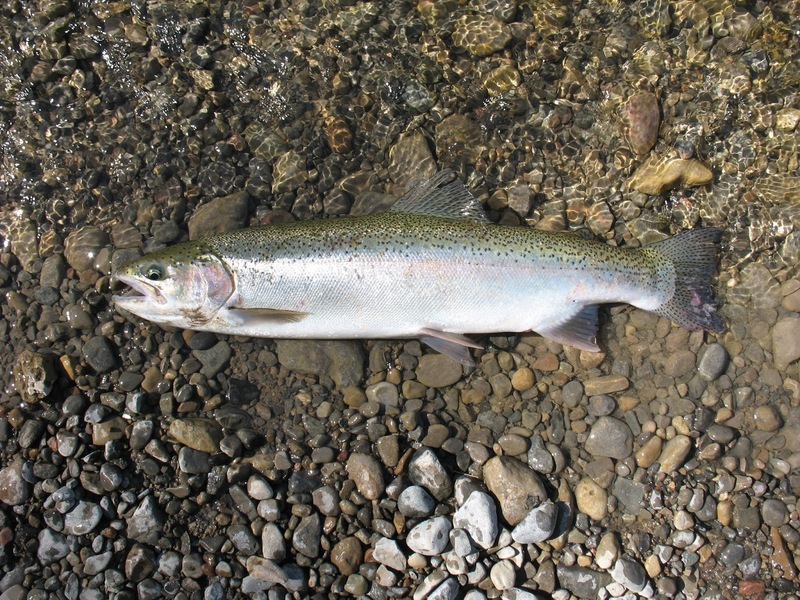 To anyone who suspect foul play, it is actually possible to induce these fish to bite under certain conditions. The theory is that these carp mistake the green twister tail for clumps of algae or weeds that washed over the dam. 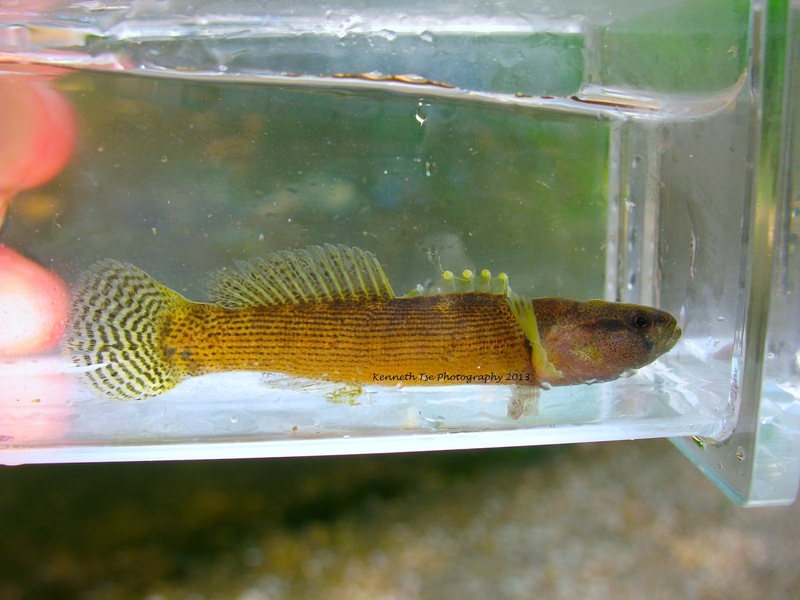 With murkier water, the fish is more likely to mistake the twister tail for edible vegetation. 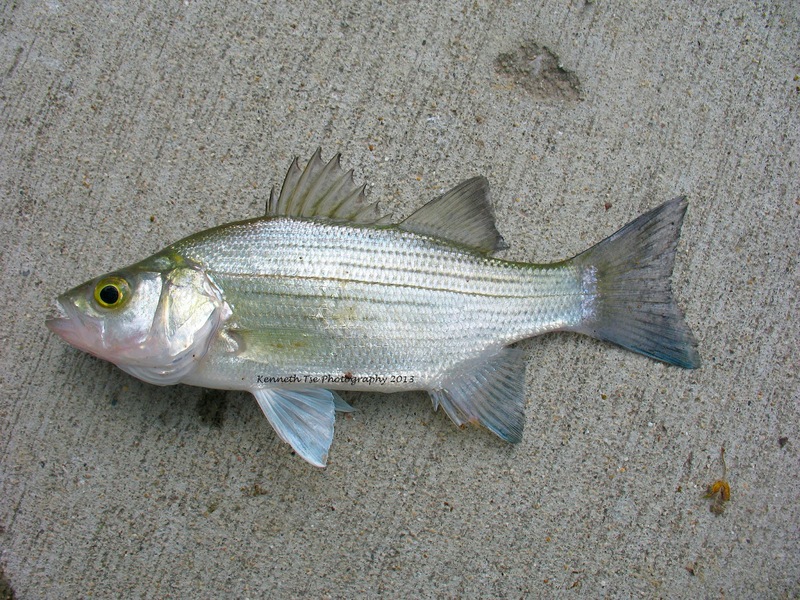 There were thousands of Gizzard Shad swirling very close to shore. 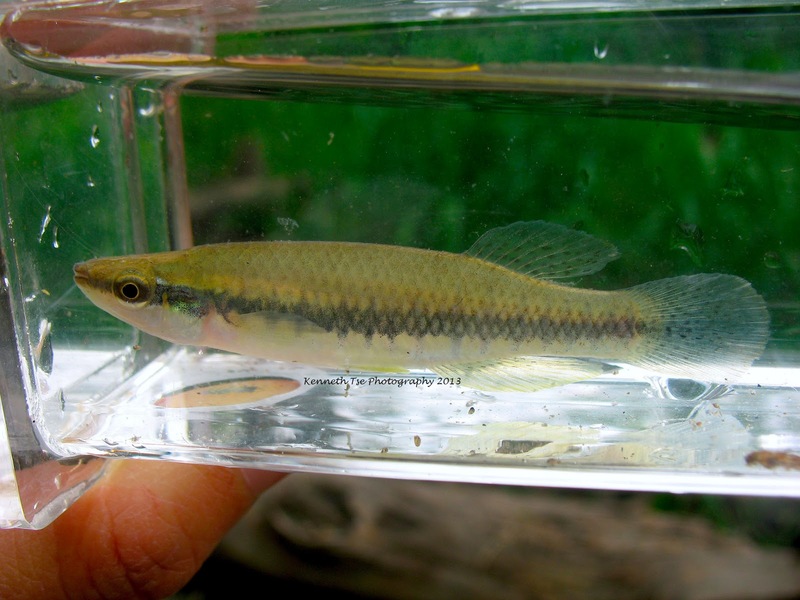 You could see Shortnose Gar swimming in and out of the shad. Our casts often snag these shads. We tried fishing for the gar with cut shad or whole shad, but the gar were not interested. And unfortunately, we didn't catch any additional Silver Carp. The Bighead Carp also appeared missing. So we headed a little downstream where Miciah and Bryce were fishing. They were focused on Common Carp and Smallmouth Buffalo, but neither of those two wanted to play. 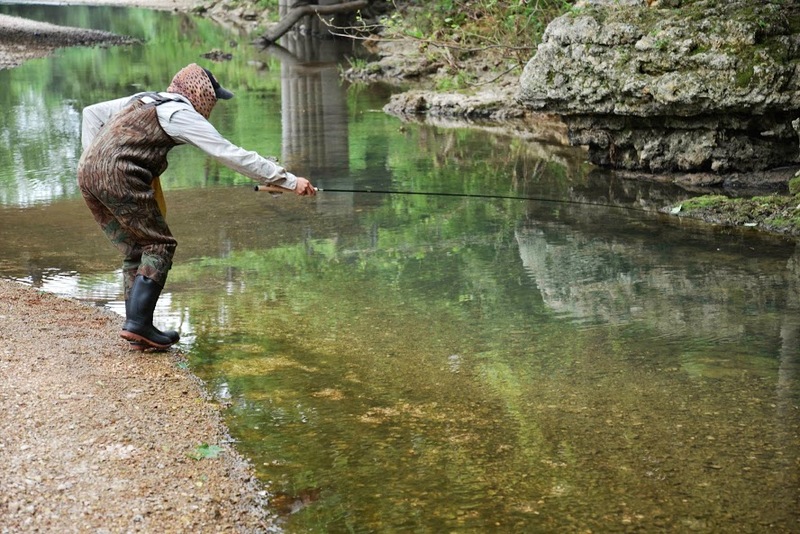 Miciah has a lot of experience fishing in this area. 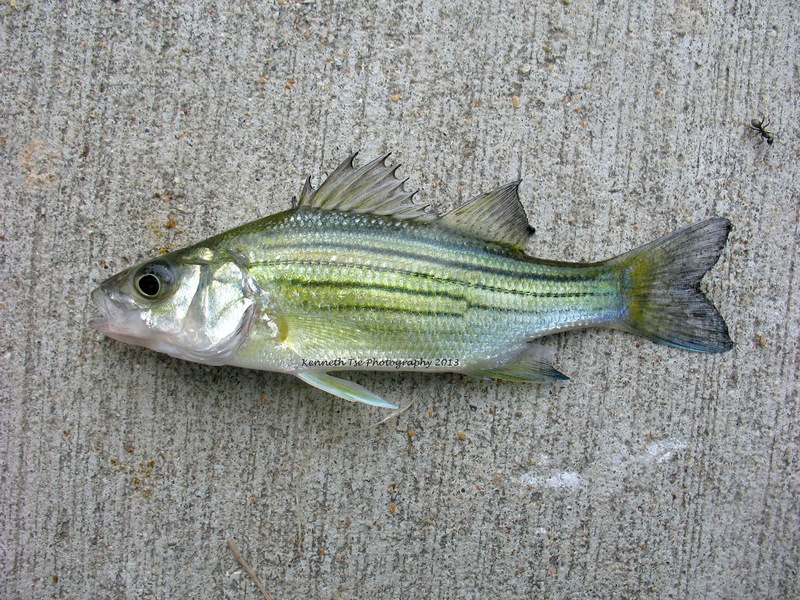 He said there were Yellow Bass close to shore and White Bass further out. I fished with the high/low rig along the rock jetty, but the snag-infested water quickly ate up my tackle. After retying three times, Miciah fished the area with a simple float and small hook on a weightless line using nightcrawler as bait. He quickly caught and teased me with a Yellow Bass, then a White Bass, and finally a White Crappie. I decided that "monkey see, monkey do" and switched to a rig similar to his. After a few casts, I caught a White Bass! This was a species I've caught before but did not have any photographic evidence. Now I have a great picture for the lifelist! 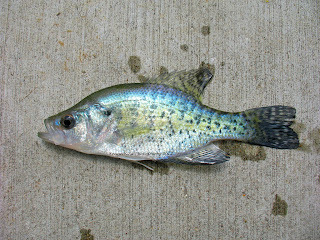 A few more cast later, I caught a White Crappie! 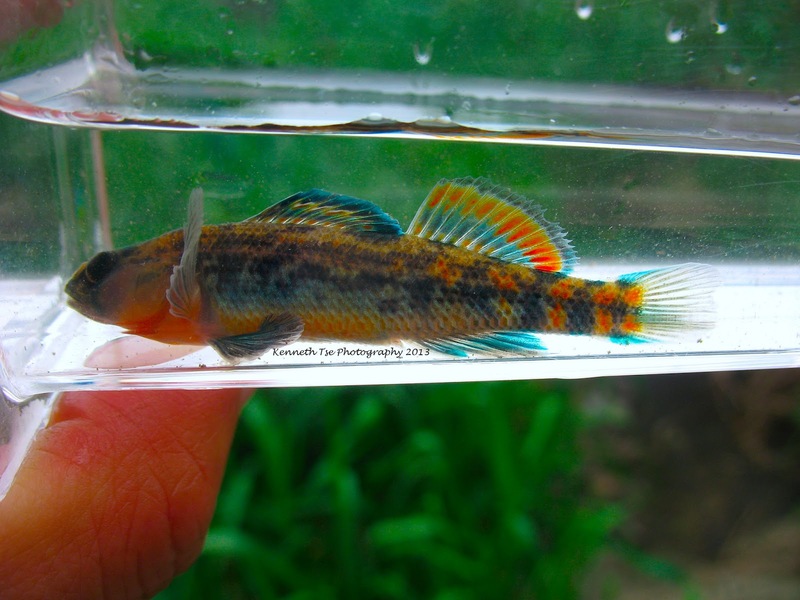 This is a species that I had tried for a few years to capture. There is one reservoir in Ontario that has both Black Crappie and White Crappie. I've only caught hybrids of these two species and it was very frustrating that the parental White Crappie may have been completely bred out. This catch was very satisfying! I caught a juvenile Freshwater Drum, a Green Sunfish and another White Crappie, but I couldn't find any Yellow Bass close to shore. So I went to poach Miciah's spot. Perhaps the school showed preference for his area. Indeed, the school was localized heavily in a small area. 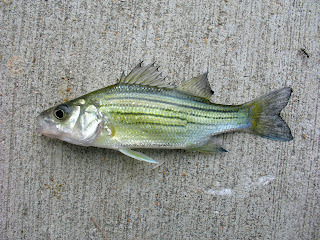 This was another great catch since Yellow Bass is not very common in many place and certainly not available in Ontario. I was not expecting to catch one since they tend to be rather migratory and schools of them are often difficult to locate. Between Miciah, Bryce, Ben and myself, we caught many more Yellow Bass, White Bass, White Crappie, Black Crappie, Freshwater Drum, Bluegill and Green Sunfish. However, the Shortnose Gar, Smallmouth Buffalo and Bighead Carp remained elusive. We decided to take lunch and move to another location. Our second location was the dam at Rend Lake. Upon arrival, I was in disbelief! There were over a hundred gar at the base of the dam! 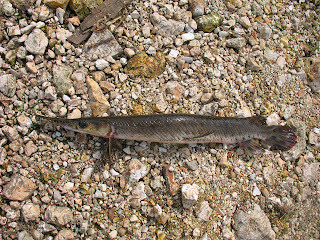 There was a large number of Shortnose Gar with a few Spotted Gar mixed in. 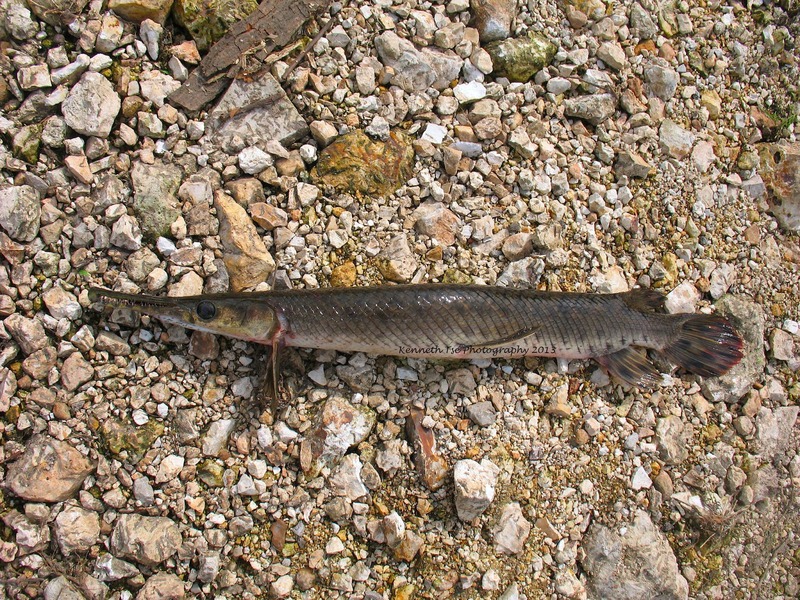 There was a few gar that easily reached 3 feet or bigger! 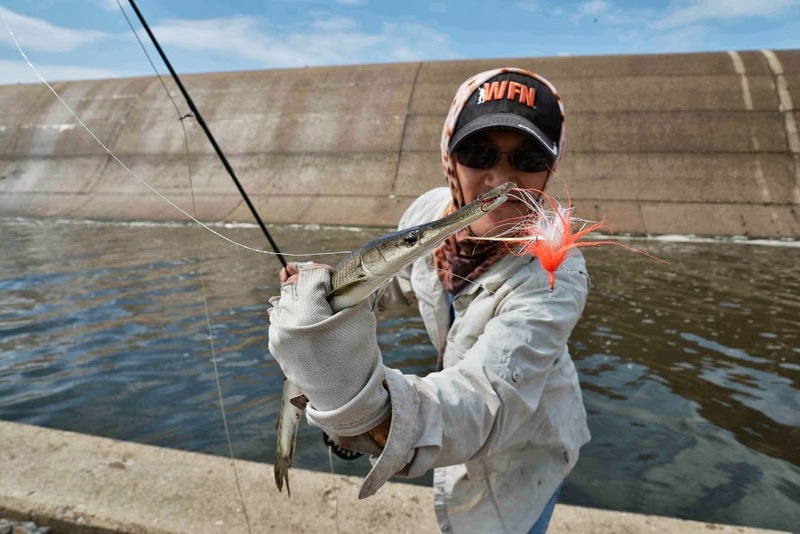 As a challenge, I took out the 8-wt fly rod to try for a gar on the fly. Ben started casting a spinner and he was soon into a Shortnose Gar. Miciah was fishing bait on bottom and fought a big Bowfin until the fish unbuttoned at hand. ...but finally connected with this when the treble hook pinned the jaw shut and the barbs barely held in place. 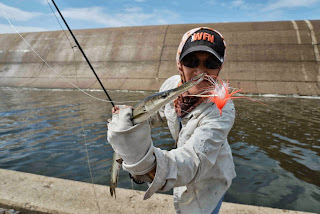 From the base of the dam, I cast and cast hoping to connect with a Spotted Gar, but only hooked and landed a few more Shortnose Gar. 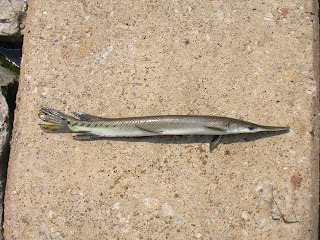 Ben was fishing from high up the side of the dam and landed a small Spotted Gar. He caught a few more gar than I did using his spinner, and then hooked into this monster Shortnose Gar! 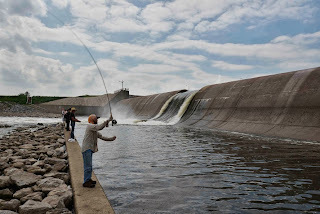 Just before we left, I tried fishing from the side of the dam using a spinner as well but it was difficult getting a hookset on those gar from that high vantage point. Miciah and Ben promised me that there will be another chance at the Spotted Gar the next day, so we motored toward Anna for dinner where Miciah and Bryce treated us to Chinese buffet. 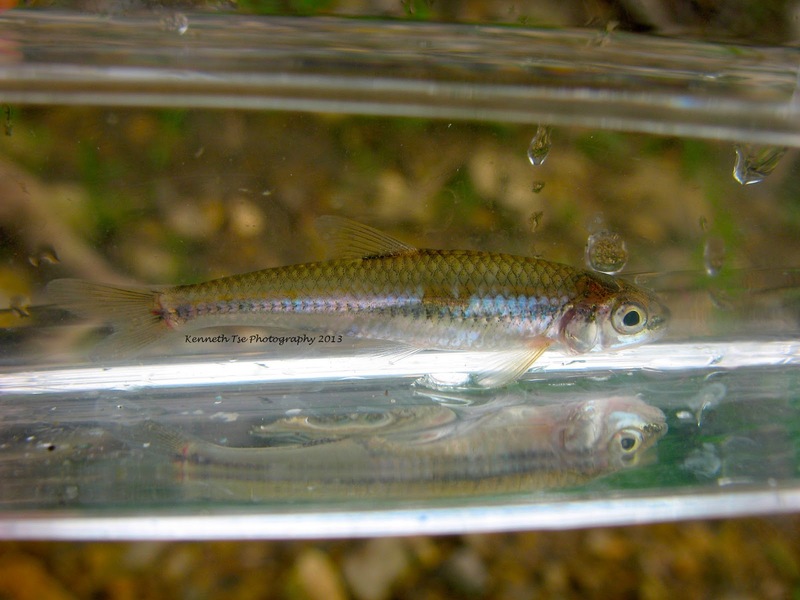 After dinner and a lot of fish talk, we headed over to Shawnee National Forest to look for Spring Cavefish. Ben had found an area holding a few Spring Cavefish. 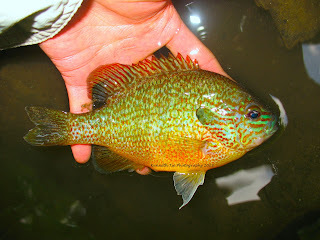 Before we started looking, we spent a bit of time fishing swampy areas for Flier Sunfish and Banded Pygmy Sunfish. Neither Ben nor I were able to attain our targets. We had to move on since we were losing light...not to mention the hundreds of mosquitoes and biting gnats that were quickly draining our blood. We also had to avoid Poison Ivy that were EVERYWHERE! I've never seen that much Poison Ivy in one place! 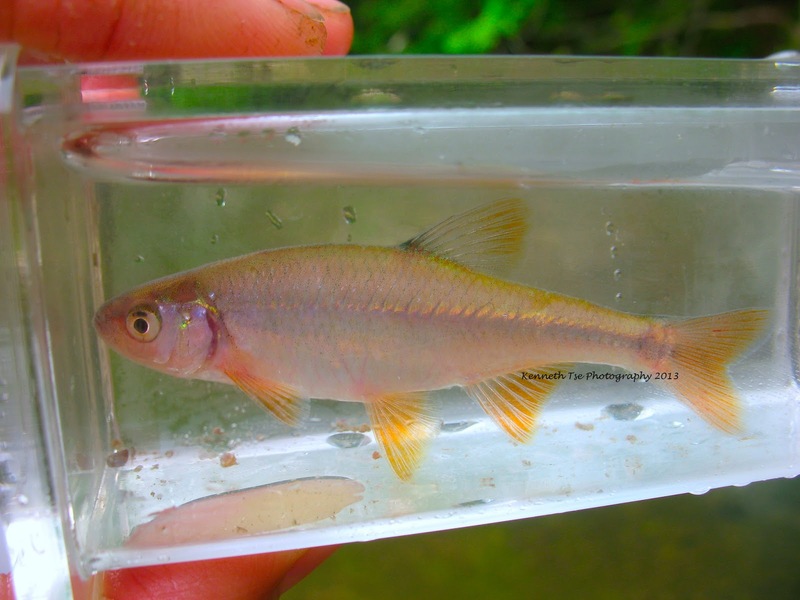 We moved a short distance to Ben's spot and quickly found a good number of Spring Cavefish. However, our activity made the water murky, not to mention that these fish were hiding under a large rock. It made targeting these small and almost blind fish a huge task. We searched another spot where there was a larger open pool. At first, we saw many small salamanders and we debated whether there were any cavefish at all. 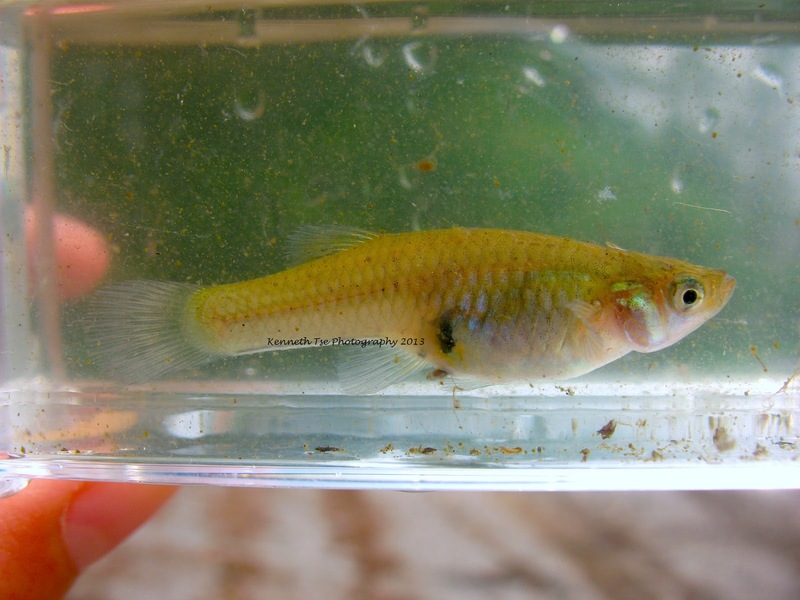 When Ben and Miciah started looking more closely, they did find a few Spring Cavefish. Wading in the spot made the water very muddy and impossible to target the little fish. It was more of an exploration instead of an attempt to catch them. At least now we have a good location to fish in the future. Ben and I left for our campsite in the dark while Miciah and Bryce returned to Anna to their motel. Ben and I were puzzled when our campsite was complete empty. We soon realize that the area was completely ruled by biting insects. Instead of setting up camp and dying of blood loss, we decide to sleep in the car that night. A while ago, Ben, Miciah and I discussed a plan to fish together in the spring. 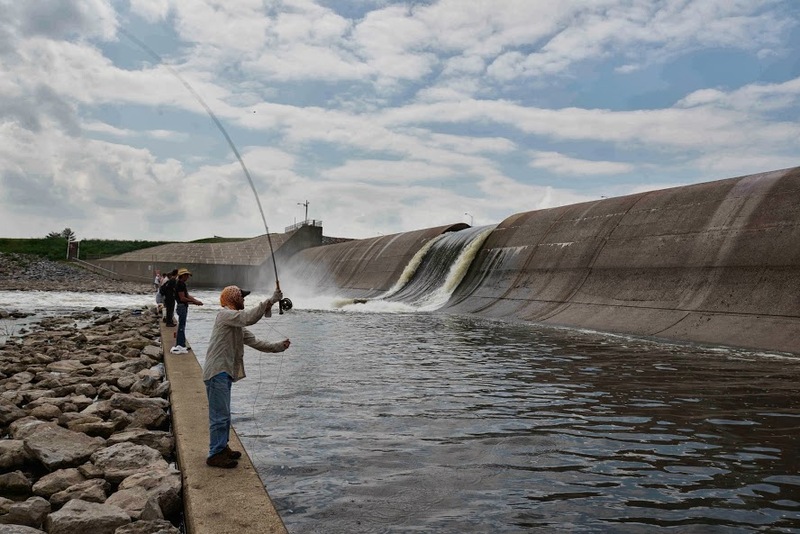 Our idea was to fish for Asian Carp and Smallmouth Buffalo at Carlyle Dam in Illinois. This simple idea soon exploded into a full blown itinerary. This trip was almost interrupted last minute when one of my experiments at work was contaminated. Ben and Miciah was oblivious about it, but it took some last minute sacrifices to make sure the trip can happen. Luckily, I was able to get on the Greyhound bus at 5:30pm on Thursday and arrived in Chicago at 6am Friday. Ben picked me up at the station and we immediate discussed the day's fishing plan. Our first stop was Kankakee River State Park. 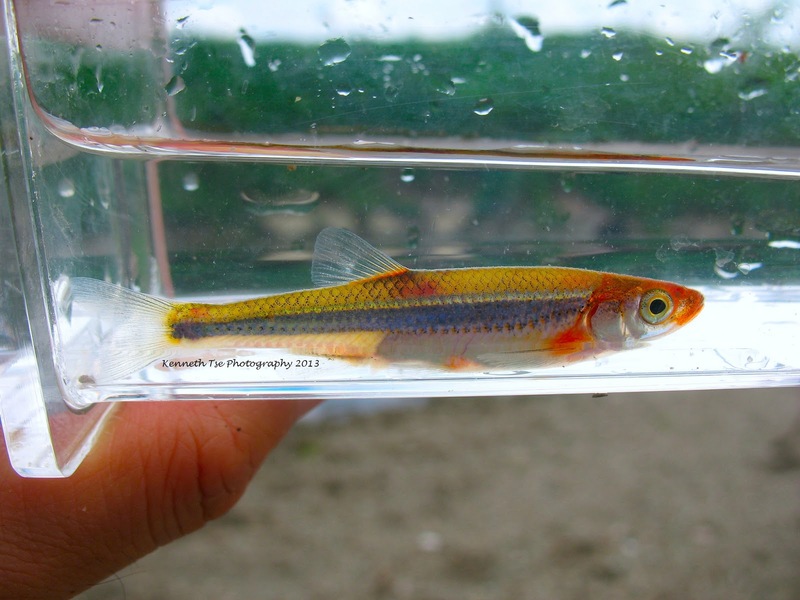 There were a few micro species and redhorse species available in the Kankakee. Unfortunately, the river was high and a bit off coloured. We searched and searched for Blackside Darter and Slenderhead Darter but they were not around. 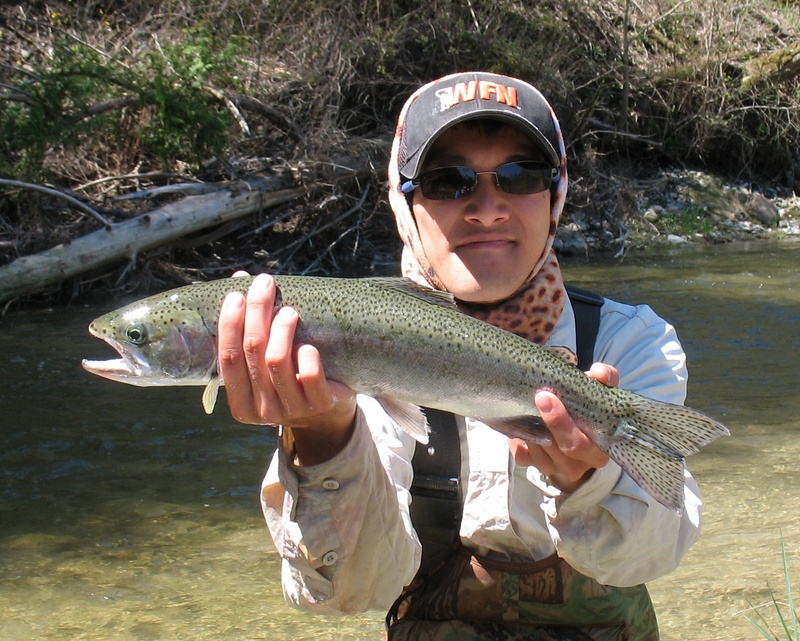 Lucky for me, most of the species in the Kankakee were new to me. 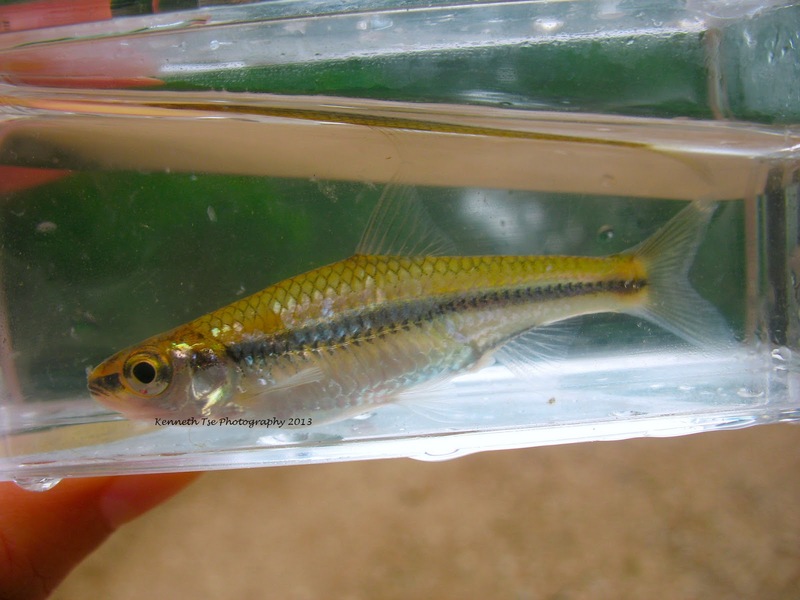 I was able to catch Sand Shiner and Bluntnose Minnow. 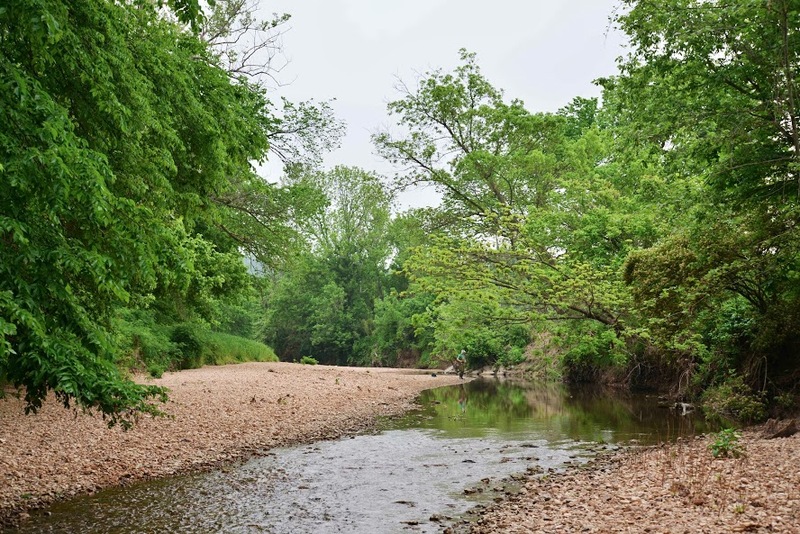 In total, Ben and I saw or captured Sand Shiner, Emerald Shiner, Spotfin Shiner, Bluntnose Minnow, Blackstripe Topminnow and Smallmouth Bass from this area. An hour later, we were on the road again to fish in the Champaign area. There were several creeks in the area that we fished. The first spot was a beautiful free stone creek. Upon arrival, we saw a multitude of minnow species. One particular species caught our eye. There was a school of Carmine Shiners. Their red spawning colour was very evident. I tried and tried to catch one of the Orangethroat Darters in the area. They were quite shy and even when I had one bite, it was difficult hooking them. 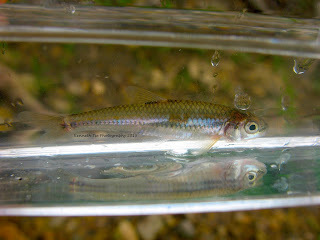 The Striped Shiner, Creek Chub, Bluntnose Minnow Hornyhead Chub and Sand Shiner were quick to bite though. In fact, they bit so quick that we had a hard time trying to catch anything else. 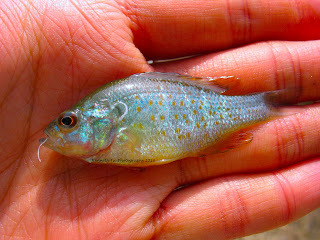 Other fish we saw in small numbers included Longear Sunfish, Black or Golden Redhorse and Stonecat. We moved to another small creek and this area was supposed to be filled with Central Stoneroller. However, they were nowhere to be seen on this day. After fishing hard, I finally enticed an Orangethroat Darter to bite. There were two darters and the fierce competition for food convinced them to bite quickly and held onto the bait longer. Ben went upstream to explore and he found some Central Stoneroller. 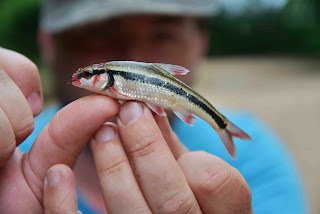 We tried at them but the other minnow species were too quick to bite. I did manage to catch a Blackstriped Topminnow. These little fish had been eluding me at the last 2 spots. The other species we caught and saw included Creek Chub, Hornyhead Chub, Striped Shiner, Greenside Darter, White Sucker and Tadpole Madtom (netted). We then moved to another stream where River Redhorse and Black Redhorse may be found. There was also some Spotted Bass in the area. However, the water was really high and the water was off coloured. Ben was quick to wade ahead of me. He did not realize that my waders had sprung a leak as soon as I was waist deep. Soon, the stream was deep enough that I was chest deep and my wader had flooded. There were also some deep holes where I was barely reaching the gravel on tip toe and just managed to push gravel with the tip of my boots. Needless to say, this spot was a total bust. We did see a Common Carp and a couple of Redhorse. The next location was much nicer. It was another beautiful stream just filled with darters! We saw what appeared to be a Spotted Bass upon arrival, and the fish took my spinner on the first cast but the bite was not good enough for a hookset. Unfortunately, the fish disappeared after. Ben found a couple of suckers and chased them for a bit. He then found a school of Central Longear Sunfish and I soon added one to my list. 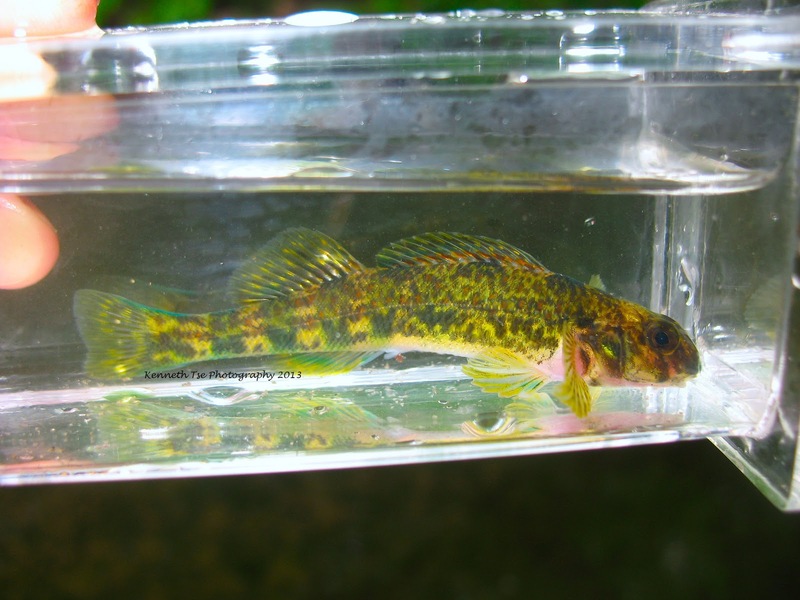 Like I said, this area was FULL of darters, especially the Greenside Darter. Once you know where to look and what to look for, these little fish were all over the place. It still took a few tried to catch one since they prefer swifter current areas and it was a bit more work positioning the bait in front of their faces. Ben also caught a male Rainbow Darter and a male Greenside Darter that are spectacular. At the end of the day, we had about an hour of daylight left. We decided to fish a discharge area where Ben's friend had caught Spotted Bass before. 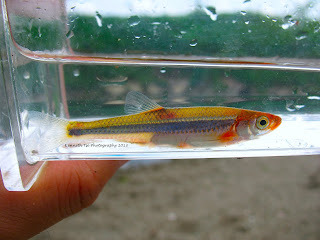 However, we only caught Smallmouth Bass and Striped Shiner, and saw a Northern Hogsucker and some more Sand Shiners. That night, we camped at Ben's uncle and aunt's property. It was nice to finally get out of my very wet jeans and socks. Ben's family were really nice people. The weather was beautiful that night and we both quickly fell asleep under the stars. 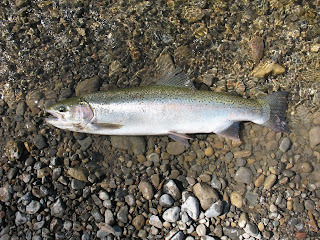 After getting into some good steelhead action last Saturday and on Thursday, I woke up today just to see a super nice day. I was supposed to go to work...but heck...I run my own experiments...I set my own hours...and to be honest, my work can wait until tomorrow. I went all the way to the spot where we had some good success the couple of trips before...and nothing was hitting. All the fish there were super spooky - they were all swimming away from my float rig. So there was little choice but to fish the Suicide pool. Went back after rebaiting...two drifts...minus the GoPro...and Thomas did a great net job for me. Got that fish at 12:15. Then I sort out the line again, rebaited, and position myself on the log again...a few drifts later...minus the GoPro...at 12:23. Okay...this has got to be coincidence...again, revived the fish, rebaited, got back on the log...one drift...minus the GoPro...at 12:36. By this point, I feel bad Thomas had been net boy the whole time while the fish above the Suicide Pool has been ignoring him. So I put my rod down and let him have a shot at the Suicide Pool. It took a while to get a hit for Thomas. I was wondering why they were not cooperating for him. Then I noticed it...he rig was not set up right. You can actually see fish swimming away his rig. It's always the little details. We took off some split shots, shortened the leader and made sure the split shot on the fluorocarbon leader is as small as possible. After we adjusted everything...it took two drifts...I can't even lie about stuff like this...at 13:25. This time I had to net the fish in this impossible pool on my own. I tried to revive the fish but it was having a tough time...so I put it into a little side channel right against a branch where there was a nice eddy for it to rest. Can you see the two of them? I went back to the log, new bait...BAM! BIG FISH!!! It was a big dark male but full of piss and vinegar. I had him controlled for most of the fight but then he decided on one last kick and right under the log he went. I had to protect my rod since the rod tip was dragged under the log as well...so all I could do was to open the bail to free my rod tip...and the hook dropped out. Then it got quiet again. Nothing going at the Suicide Pool at all! It was complete lock down. 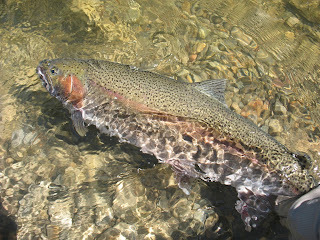 So I went to fish the pool immediate upstream. Just at the tail of that pool where it enters into the Suicide Pool, the fallen log also had a ball of root that was submerged. I could see the head of a steelhead poking out. The rest of the fish didn't want anything to do with me...so I figure the hiding fish probably felt a little more secure and maybe hungry. Thomas had missed a fish there earlier in the same spot. The first drift to that fish...it came out and slammed the bait! at 17:24. Okay...I have a 30min wade back, a 30min drive back...really gotta go! 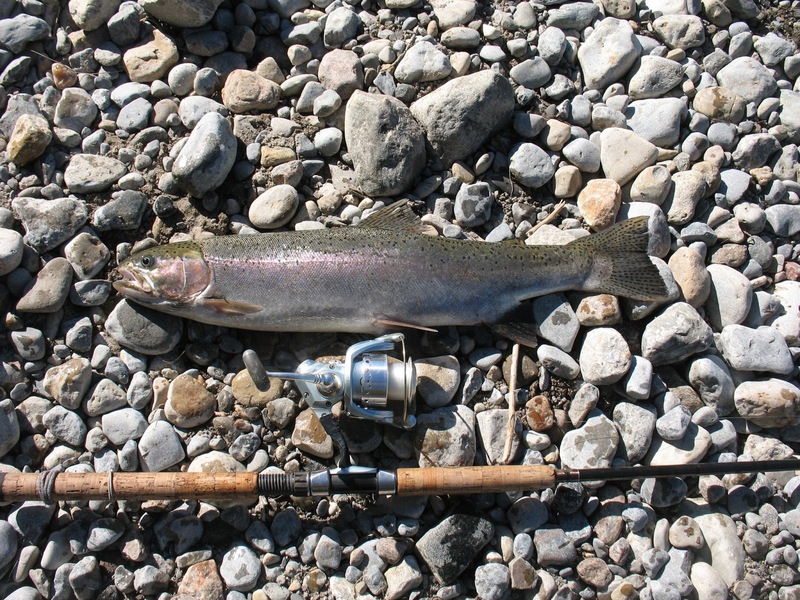 11 STEELHEAD LANDED, 4 BROKE OFF...and I didn't even count the subtle hits I got here and there...it was the BEST DAY EVER!!! Anyone want to buy a GoPro? I got one for sale.